Jennifer Aniston returned to the red carpet last night for another stint in front of the flashbulbs, this time at the premiere of her new movie We’re The Millers, in Berlin. The A-lister played up to the cameras, pouting, posing and embracing her racy character in the movie, who moonlights as a stripper. Jen looked stunning in a black structured dress and matching shoes by Alexander McQueen, which she teamed with Fred Leighton jewels, a Givenchy bag – and her whopping engagement ring from Justin Theroux. 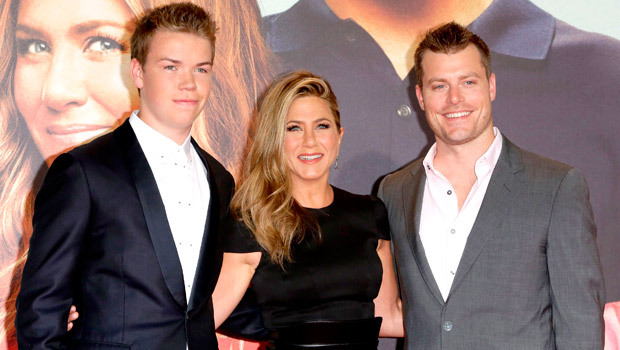 The 44-year-old was joined in Germany by her co-star Will Poulter and the movie’s director, Rawson Marshall Thurber. Jen has provided us with a gorgeous array of style statements on the promotional run for her new movie. In New York last week, she rocked a tight purple satin dress, in London on Wednesday night she wore a pretty floral prom dress by Dior, and last night’s turn was by Alexander McQueen. We. Want. Her. Wardrobe. The actress has travelled alone, leaving her fiancé Justin Theroux back in LA, but that hasn’t stopped her from being plagued by questions from reporters about her impending wedding – and the possibility of a mini Theroux in the near future. In an interview with an Australian radio show this week, Jennifer said: ‘It does feel a bit like they’ve exhausted the question, and also the speculations. It’s all been pretty much exhausted. Why not just wait until we actually get to have the fun of announcing something. ‘Who wants to play the guessing game, whether it be (a) family, wedding, this, that, the other thing.’ Guessing games aside, doesn’t she look amazing!